Inspiring women are go-getters. They make things happen. They live life with no regrets. They are learning about themselves and reaching their full potential. They are not afraid to take risks and just go for it. I talked to Bianca Elgar, a new star on the British fashion scene, championing a versatile capsule wardrobe and bold accessories. The idea for the business came when she relocated to Belgium for six months with her two teenage sons. With limited space she had to pack light and keep her own clothing to a minimum. She decided on her favourite black basics, and a variety of bright scarves to dress them up with. Inspired by the opportunity of creating a variety of looks with just a few items, as well as showing off scarf prints in a new way, she decided to start her own fashion brand once back in the UK. Bianca has always been artistic, and her background in silk-screen printing saw her producing a range of soft furnishings for the home from her Oxford workshop. 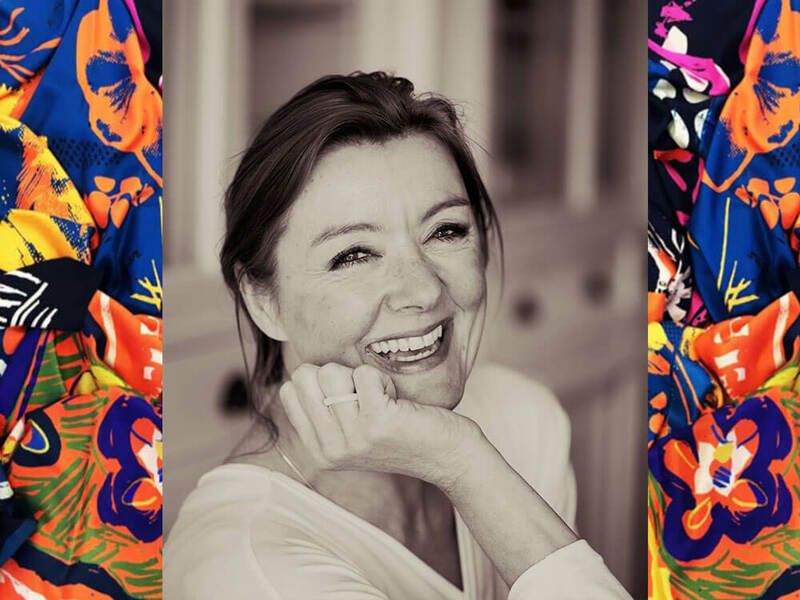 She has also previously studied upholstery and furnishing, made her own statement jewellery, as well as embarked on a textile design course. Bianca is now bringing this experience to her eponymous fashion brand, which she established in 2015. The brand sets out to merge classic elegance and modern art, creating pieces that encourage you to have fun with fashion. Her scarves come in deeply vibrant colours and statement prints, whilst her clothing is made in neutral shades to allow for individual styling. Expertly crafted with delicate stitching and attention to detail, her collections are 100% British. The items are all heirlooms, designed and made to last for generations. My biggest challenge was that I had no experience in fashion or business. I had to learn on “the job” by making mistakes, lots of them. I suppose the other biggest challenge is to not lose the passion for what you are doing. I work with a great team. By doing lots of research, keeping up to date with what is going on in the industry, constantly learning and hard work. Just the notion of knowing that there is an answer for anything, if you look hard enough, helps me with overcoming anything that is in front of me. Do it because you believe in it! It has to be meaningful and relate to what you are trying to express. The quality, the product and the creativity always come first. Know who you are, be yourself and believe in your own values – they can be universal, if they are true. Then you’ll be confident in what you stand for and in the excellence of your work. The customer understands that, which is the main point at the end of the day. I have unchanging values; dedication to style, creativity, craftsmanship and quality. Please support Bianca and visit her website to find our more about her latest collection!